If You Suffer With Junk Mail Posted Through Your Letterbox On A Regular Basis, We Hope We Can Help Reduce This, Our Sticker Has Been Proven To Reduce Junk Mail By Upto 90%. The Average Home Can Recieve Upto 640 Items Of Junk Mail Per Year. By Using Social Media To Spread The Word Of Our Products We Can Reduce The Amount Of Waste Going Into Landfill In The UK And Reduce The Amount Of Trees Cut Down To Be Used To Produce This Unwanted Marketing Materials From National Companies To Local Businesses. 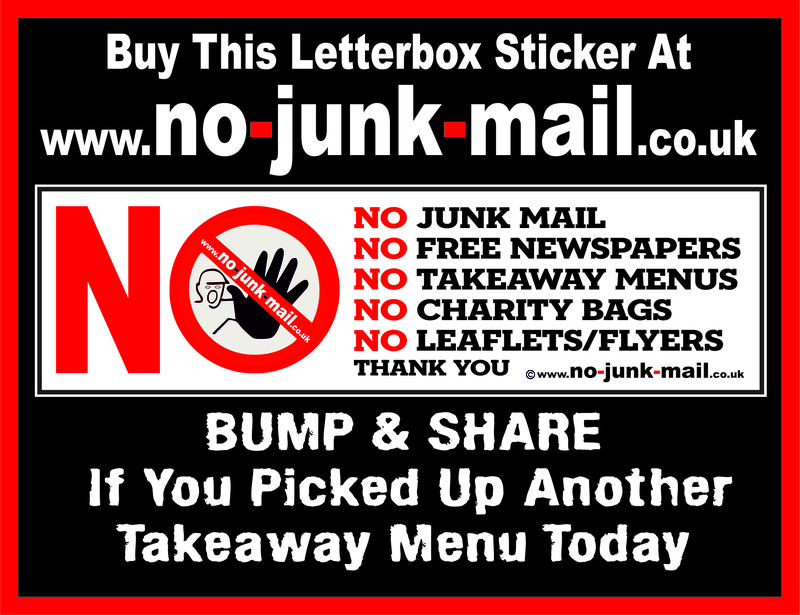 We Have Reduced The Cost Of Our Big Red "NO" Junk Mail Sticker For Those Using Social Media To Help Raise The Awareness Of Junk Mail And The Anti-Junk Mail Products From This Website. You Can Buy Your Letterbox Sticker Here For Just 99p Plus 60p 1st Class Postage. If You Buy Before 3pm You Should Have Your Sticker The Next Working Day.
! How Much Junk Mail Can You Stop ! "Probably The Best Purchase I Have Ever Made...It Simply Stopped The Junk Mail"